A subsun that glitters in separate crystals against the ground can look pretty nice, but in the photos it as a rule turns out a disappointment: only a few anemic glints are captured. But there is a recipe to make the image match the visual perception or go even above it. That is to stack a series of photos using the lighten method (in Photoshop). 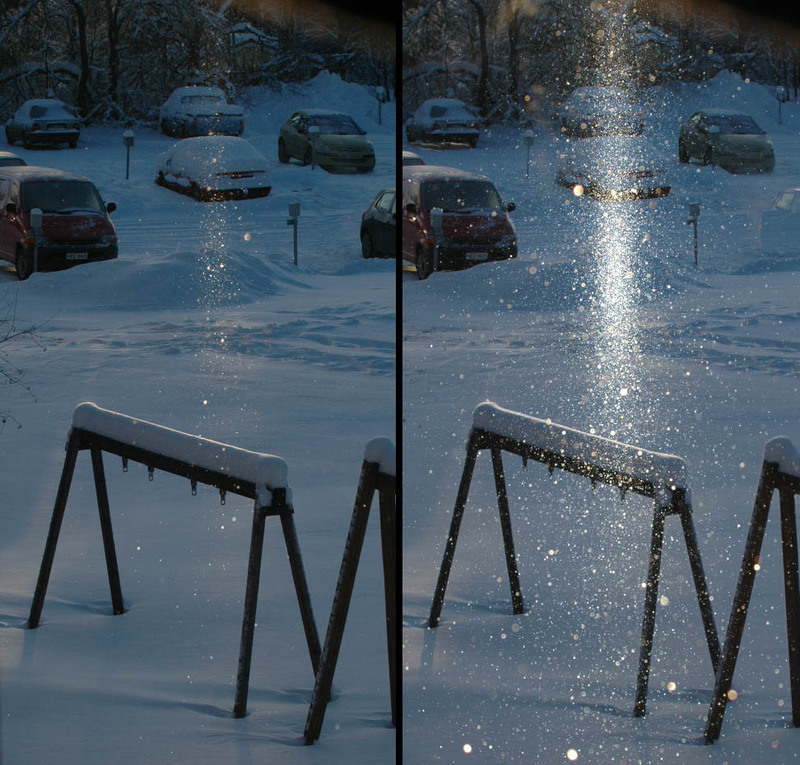 In the image above, there is a comparison of a single photo and a lighten stack of 99 photos. The camera was on tripod and the photos were shot fast with series mode. During shooting a car was moving in the parking lot (a ghostly image of it is seen on the right in the stacked image). These frames were omitted from the series because sun's reflections from the car might have been disturbingly imprinted in the stack as the lighten mode takes always the brightest pixel of the stacked images. It really makes a difference! Good to see how the lighten method works with cases other than surface halos. Timo, Photoshop's lighten blending mode is just that: a maximum pixel intensity value is chosen from the pack of images, here 99 frames. Well it is good to know there is a software that does the lighten stack automatically. I had a quick look at the IRIS tutorial but did not figure out yet which one of the arithmetic, median, min-max rejection, adaptive weighting, sigma median or sigma clipping modes would do the work. Or do I have to write a special command for it? 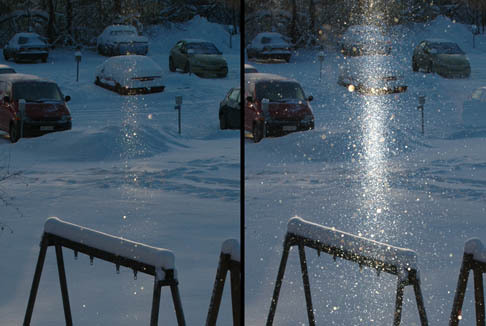 Picture made with this lighten method is also called as a "peak-hold picture" since it keeps the peak brighness of each pixel. There is some videocapture programs which can do this automatically for captured videos. Yes, also star trails software rely on this method. Sometimes it gets good results with high cloud displays when the display changes very fast and you only get a few frames. Thanks for the tip Jari. The description of the Startrails application seems really promising. By the way, I already experimented with IRIS, but did not find yet the right controls for "peak-hold" mode. I don't know if you can max-stack with IRIS through the menus. You can open the command prompt and enter the command: add_max picture which max-stacks picture.pic on the disk with the picture currently loaded. A longer sequence can automatically be max-stacked with the command: add_max2 series number, e.g. "add_max2 subsun 3" will peak-hold stack images subsun1.pic subsun2.pic and subsun3.pic at IRIS working directory.